Picture Tube: The Picture Tube is the costliest and most important part of a television receiver. 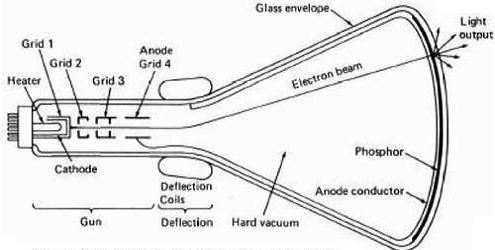 The picture tube is a cathode ray tube similar to that used in a Cathode Ray Oscilloscopes. It consists of an evacuated glass bulb (funnel shaped) which has an electron gun and phosphor screen. The inside of the screen is coated with a luminescent material that produces light when electrons strike the screen. The narrow neck contains the electron gun that produces the beam of electrons. A black and white TV receiver has one electron gun and a screen with continuous phosphor coating that produces a black and white picture. A color picture tube has three electron guns with screen formed with vertical stripes of red, green and blue phosphors. Working: When cathode is heated up it emits electrons. The control grid controls the number of electrons and the accelerating anode provides a high speed to the electrons. The focusing anode focuses the electrons in the form of a beam so that this beam of electrons is sharply focused at the screen. When this beam strikes the screen, a dot of bright light is formed there. These electrons can be deflected from the centre of the screen to any point of the screen. The deflection of electrons is achieved by deflection yoke placed on the neck of the CRT. Two pairs of deflection coils are placed at the neck of the picture tube. One pair of coils is placed at the neck of the picture tube. One pair of coils placed above and below the electron beam produces horizontal deflection. The pair of coils placed left and right of the beam produces vertical deflection. The deflection of beam is possible only when required current is given to horizontal and vertical pairs of coils. As soon as current is given to these coils, a magnetic field is produced which causes the movement of electrons in horizontal and vertical directions. These movements of electrons form the complete scanning raster.